Current Status: Active; formed by the merger of Lafayette and Greylock Lodges, 04/25/1988. Grand Lodge officers visited North Adams on April 25 to perform the merger of Lafayette and Greylock Lodges into the Lafayette/Greylock Lodge. Following the ceremony the Grand Master installed the newly-appointed officers into their respective stations. The merger reduces the number of Lodges to five in the 15th District. Lafayette was chartered in 1847 and Greylock dated its precedence to 1871. On August 14, 1997, Lafayette-Greylock Lodge held a chicken BBQ on the lawn of the North Adams Masonic Building to commemorate the 150th Anniversary as a Lodge. The first meeting was held on Saturday, August 14, 1847, somewhere in the North Village of Adams. The Past Masters of Lafayette-Greylock Lodge raised two men, Michael J. Hernandas and Roy W. Dupree, to the Sublime Degree. The guest of honor was Wor. Albert E. Garratt, the oldest living Past Master in Massachusetts. He served the Lodge in 1927, some 70 years ago! Bro. Garratt was born November 11, 1895, in Fall River and was Initiated on January 17, 1922, a 75 year member. He now resides at the Masonic Home in Charlton. He was presented a 70 year pin and a Table Lodge apron by the Lodge. A sesquicentennial directory was printed containing a list of all members, the by-laws and a brief history of Lafayette-Greylock Lodge. This directory is dedicated to Albert E. Garrett and in memory of Rt. Wor. Donald O. Canedy, P. D. D. G. M. and all departed Brethren of Lafayette-Greylock Lodge. Wor. Albert Garratt, pictured front and center, with Wor. 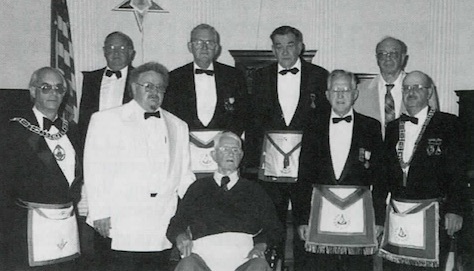 Alan D. Horbal, Master, and Past Masters from Lafayette-Greylock Lodge during a ceremony to honor his 70 years of dedicated service.